EPS-1 accepts up to 1 kW of input power from solar panels, batteries, and other external sources, which it converts to output power at various standard and user-selectable voltage levels using versatile and efficient buck/boost switching blocks. A radiation-resistant or rad-hard FPGA controls each GaN FET-based buck/boost block at MHz switching frequencies. Each block uses a common design with a native 60V and 8A maximum rating, and has a minimum efficiency of 96.5% over a wide range of operating currents, a programmable current limit, and protection against overcurrent and overtemperature faults. 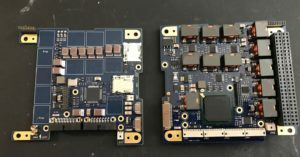 The card conforms to the established CubeSat module form factor and 104-pin connector.